Godetevi il grande Mid-Coast del Maine con tutta la sua grandezza, dalla vela, aragosta, parchi statali, escursionismo e pittoresche cittadine. Sedersi e rilassarsi e hanno una splendida vista del porto di Belfast da entrambi i mazzi. Questo meraviglioso con aria condizionata 3 camere da letto, 2 bagni cottage è stato riprogettato con gusto e completamente arredato da premiato Janis Stone, da interni da Janis. Il cottage dispone di un involucro intorno alla piattaforma al primo livello, e un belvedere pesce persico piccolo dal ponte superiore. Abbiamo recentemente installato aria condizionata per offrire ulteriore comfort. Fate una breve passeggiata sulla nuova passerella per il centro di Belfast per fare shopping o godere di uno degli eventi divertenti questa estate nella bella e culturalmente fresco città di Belfast. Young Lobster Pound e Perry sono anche a pochi passi dal casolare. La città di Camden è di 18 miglia a sud e Bar Harbor è di 58 miglia a nord di Belfast. La bellezza di Belfast: Belfast è una ridente cittadina costiera che rappresenta il meglio di ciò che una vacanza nel Maine ha da offrire! La piccola città ha ristoranti e negozi che la rendono divertente per tutta la famiglia. Le attività sul litorale ne fanno un luogo ideale per trascorrere una settimana o un mese. Godere di spettacoli teatrali, concerti e altre attività culturali. Belfast è stata chiamata una città culturalmente fresco. Ci stanno facendo artisti che lavorano in città e di solito hanno il loro lavoro in mostra. Il primo bagno al piano è una nuova aggiunta al cottage. E 'stato costruito nel 2007 per offrire agli ospiti un facile accesso e ospita anche la lavatrice e asciugatrice unità impilate. L'unità è dietro una porta a pannelli. Ci sono due grandi campi da golf pubblico nelle vicinanze. Uno situato in Searsport, a circa 8 minuti a nord e uno a Northport, a circa 10 minuti a sud. Moosehead State Park con grandi sentieri, aree pic-nic e magnifica vista Penobscot Bay è a circa 7 minuti di auto a nord del cottage. Loved this home! A short walk to the foot bridge and across to downtown made this the perfect location. Views of the water from virtually every window. The home was very well appointed with everything we needed for our stay and was very clean! We plan to return in the future. The owner was very helpful and responsive to any questions. Highly recommended. HI Ann: Kerry and I are so glad you enjoyed your stay in our Maine home and your time in Belfast. We strive to make our guests comfortable and to have all the items one would need while away. Our cleaning crew takes great pride in staging the house for each and every stay. Belfast is such a great coastal town. The Footbridge, Harbor Walk, and the new Rail to Trail (all within minutes from our house) make it easy to enjoy all of Belfast. Look forward to hearing from you when you are back in the area. What an unexpected surprise! Although the owner provided a very accurate description of the house, his words didn’t describe how clean, cozy and convenient his home-away-from-home is. The place was absolutely spotless. Everyone in our party of 4 seniors felt comfortable immediately. Belfast is a beautiful little village with a lot of things to do. My personal favorite was to take a brisk morning walk over the footbridge that crosses the area where the Penobscot River meets the bay. We would then walk along the waterfront filled with lovely sailboats and wind up at a great little downtown diner for breakfast. The village has a wide variety of restaurants, but to be honest, if you want to get the true taste of Maine, call Young’s Lobster Pound, (just 4 minutes away from the rental) order your lobster, (they cook them for you) bring them back to the house, lay out the nice dining table there, and along with some great bread and a glass or two of local wine, enjoy a wonderful dining experience. We have stayed in many well-stocked VRBO units over the years, but never before have we been provided band-aids, dental floss, shaving cream, makeup remover, and huge plush towels, along with the usual shampoos and body gels. This is just one example of the attention the owners pay to the comfort of their guests. Although we never met the owner, he phoned to see that we got settled in on our arrival and followed up with some short calls to see how we were doing. Thanks, Dennis, for a great stay in your home. Only one thing - you need a couple more tools to crack the lobster claws! We are so glad that everyone enjoyed the town of Belfast. Rollies, Darbys, and Youngs offer a great local Maine dining experience. We wish we could have joined you! Walking over the footbridge during those early morning hours is special. Please travel home safely and we hope to have you back. I will order more lobster utensils right away! This is a great central location to everything up and down the coast. The house is well equipped and super clean. Sheets/beds/pillows very comfy. Loved the walk over the water into town. The ONLY drawback is that it is right on Route 1 and you can hear a lot of cars/trucks/traffic on the weekdays. It would not prevent me from booking again though- was super easy access to get to everything, including grocery store, etc. Dennis was super easy to work with and flexible on our arrival/departure time as well. Was a great trip. We are so glad that you and your family enjoyed our Maine house and your trip to Belfast! The house provides such terrific and relaxing views of the harbor from the two decks as well as a centralized location to begin short treks around the area. Janis Stone, the award winning interior designer, has done a fantastic job and keeps our house well appointed and comfortable. We purchased the house over a decade ago, and had to take into account the proximity of the house to Route 1 and the beautiful views the property afforded of the harbor as well as the short walk down to the footbridge into town. Over the years we have planted several large evergreens, three river birches and other tall shrubs that shield the cottage from the main road. We usually have the air conditioner window units running during the summer months as well, and this was the first week we removed them. This tends to alleviate the sounds of cars on those busy weekends in the front of the property as people travel through Maine's coastal towns. We hope to see you back on your next trip. We loved our stay at this beautiful property overlooking Belfast harbor and just a short walk to town over a scenic pedestrian-only bridge. The home is in excellent condition, nicely decorated including all necessary kitchen, bath and bedroom amenities. Two nice decks with beautiful views and a big yard. The host, not on-site, provided excellent customer service, was easy to communicate with, always responded quickly and provided useful local information so that we did not have to spend time looking for anything. We deeply appreciate your kind words about our Maine home. We are so glad that you and your guests enjoyed Belfast, one of Maine's best kept secrets. We look forward to having you back on your next trip up to this wonderful coastal town. We had a terrific visit. The Kelleher's beautiful cottage was the perfect central location and comfortable home-base for our exploration of Maine's mid-coast. 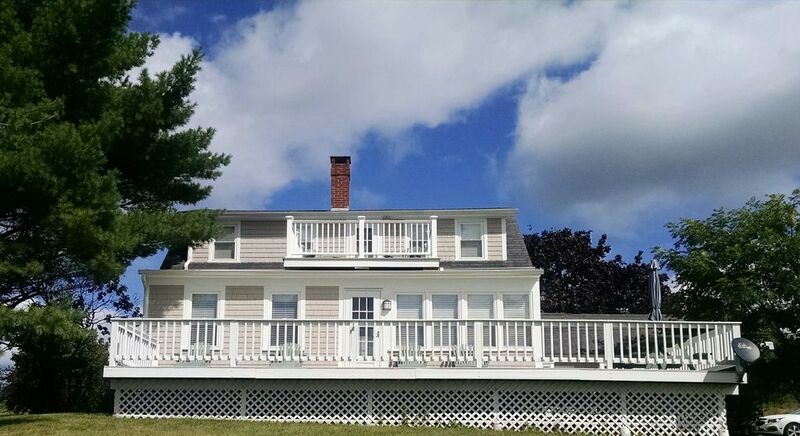 The house is spacious yet cozy with two decks to relax on and enjoy the harbor views. Every attention to detail shows around the house. It's tastefully decorated and well stocked from the living areas to the kitchen to the bathrooms. As my sister commented, "They must be readers because the bedside lamps are actually tall enough to read by!" Belfast is a charming town with a beautiful harbor - not so touristy as other towns along the coast. We had a really delicious vegetarian meal at Chase's Daily and afterward bought the fixings for a wonderful dinner salad at their produce market located right in the restaurant! At the opposite end of the spectrum we enjoyed a great burger at Rollie's one night. Thanks for helping make our first visit to Maine special! Hi Elizabeth: We are thrilled that you enjoyed Belfast and our Maine house. Yes, we are readers, and each trip we take additional books up for our wonderful guests to enjoy. That our future retirement house, so its great to have folks like you enjoy it. Rollie's is a great town place to grab a meal, as you mention the burgers are great, and we like the stuff turkey sandwich with cranberry. Delvinos is our favorite, and Three Tides on the water is a special place as well. Dockside, Young's, Chase's, Darby's, so many places to enjoy a great meal, at very reasonable prices. Belfast is such a great coastal town to enjoy. The beauty of Maine is present in Belfast (harbor, Moosepoint Park, Main Street and of course the surrounding area. The low key town with some cool places to shop and eat makes a vacation special. We stayed 4 nights in September 2018. The house was spotless and well furnished with dining and kitchen utensils. Location is conveniently located about a half mile walk across a footbridge to Belfast, where there are several excellent restaurants. This property was perfect for our visits to Camden and Rockland to the south and Acadia and Bar Harbor to the north. I highly recommend. Hi Sam: Kerry and I are thrilled that you enjoyed our Maine house during your recent stay in Belfast. Belfast is one great seaport town that more and more people are discovering. Enjoy the rest of the year and hope to have you back on your next trip. We will provide discounts off the listed rates for extended stays Unfortunately, we cannot accept pets. There are local facilities that can care for your pets located in the Belfast area. There are a good deal of activities throughout the year around Belfast. We are happy to rent the cottage on selected weekends during the fall, winter and spring!